The Costi's Fishmarket joined our Mission to help provide access to “Clean Water for All by 2030”. This Mission was initiated by the United Nations. A big thank you to The Costi's Fishmarket’s team and customers for joining this extremely important mission on 09 May 2018. 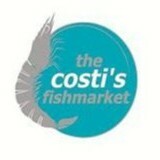 The Costi’s Fishmarket was established by the Costi’s family in 1984. Since 1991, when the Castle Towers was originally expanded, ownership of the business was effectively passed down to its next generation and has been operated by George Costi and George Christou (together with their respective families). Consistent with the family nature of our business, our business model is founded on strong values of commitment, integrity and honesty. Our business philosophy is one built on customer focus. Indeed, we consider our customers our most valuable asset. We are not affiliated with any franchise operation which bears the name “Costi” or “Costi’s”. We are an independent operator, a fact we are most proud of and which we believe affords us the tight controls that are critical to delivering a high quality and cost effective Australian Seafood product. Indeed, both George Costi and George Christou have a very “hands on” involvement in the operation of the business. Between them they source product on a daily basis through their 4:00 a.m. trips to the Sydney Fishmarkets, they prepare fresh products “on site”, and they oversee pricing as well as all other critical trading aspects of the business. They are of course capably assisted by their valued staff, including designated filleters and sales assistants. Our mission is to consistently meet our clients’ needs, and in fact exceed them where possible, without compromising our commitment to delivering a cost effective and high quality product. We aim to do so by creating a market atmosphere whilst endeavouring to maintain a highly professional operational standard.